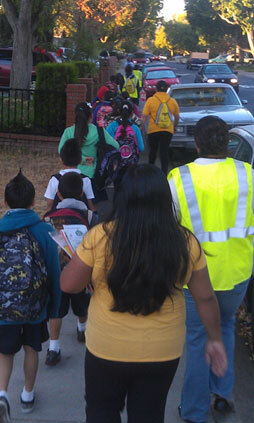 Injury Prevention and Physical Activity Promotion Safe Routes to School (SRTS) program partners with cities and CBOs throughout Contra Costa County, including Richmond, Hercules, Pinole, San Pablo, Concord, Pittsburg, and Bay Point. SRTS is a national program, aimed at encouraging school-age children to walk and bike to work as a form of getting regular exercise and community building. Implementing SRTS efforts in lower-income communities must address not only walking and biking issues but also topics that impact perception of safety, such as fears of violent crime and robbery, gang activity, deportation, as well as a general distrust of government representatives and law enforcement. Both youth and adults share these fears that often serve as obstacles to their interest and participation in traditional SRTS programming. Common SRTS activates include in-class presentations, leadership development, guided walk to school days (e.g. 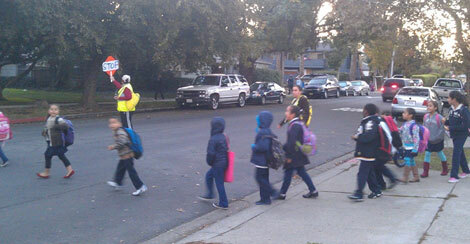 Walking School Busses), assemblies, bicycle rodeos and on-campus kiosks that promote walking and bicycling. SRTS is one approach CCHS uses to build community and reclaim streets for the safety of children with themes such as "take back the neighborhood" and "peace on the street." SRTS events promote collective ownership and responsibility for safety across different ages, ethnicities, "turfs," city departments, school personnel, and youth-serving agencies. In the face of violence and drug trafficking on school routes "we're saying 'Not on my block, not anymore!" to quote an elementary school mother. When we're asked how to rid school routes of bullying and speeding drivers, we say there's an opportunity to show leadership and "achieve safety and respect in numbers."